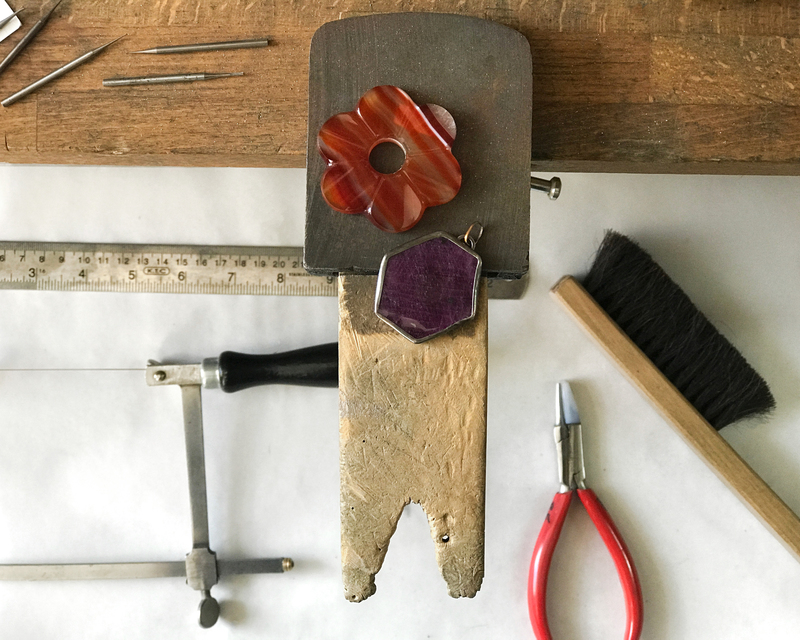 In this 5 session course students will explore variations in setting large scale gemstones as pendants. Working with stones that are at least 3 centimeters in size, students will become familiar with the specific issues that arise when fabricating and setting larger stones. Increasing the size of a setting brings new problems that aren’t apparent in smaller settings. Among these are material conservation to keep costs down, weight issues for wearability, how pieces will sit on the body, and balance in the overall design of jewelry elements. Technical considerations also shift when determining structural aspects like metal gauges, material profiles, heating and soldering issues, and specific approaches to setting. For this class students will build settings using bezel wire, sheet metal and round wire. Three approaches for different types of gemstone cuts will be taught and other style variations will be discussed. Students should bring stones requested on the supply list as well as any others they have on hand to be considered for setting. Students may also work with non-gem material if desired. Fitting, sawing, filing and delicate soldering applications will be emphasized. Patination and surface finishing will be covered as well as some tool modification. This course will help students become more precise with the creation of their settings, while giving versatility to their designs. Basic metalsmithing and jewelry fabrication skills required.